BUY NOW and make the most of your living or working space by mounting your TV to the wall for convenient and comfortable viewing. This product can also used for mounting when a stud is not available. The provided revolutionary toggle bolts can hold upto 200lbs on 1/2″ drywall. ✔They make smaller holes and are 4x faster to install then wing bolts or wing toggles. ✔Pre-installs without the bolt to make handling of fixture easier. ✔Reusable in the same hole – remove the bolt without losing the anchor. STUD NOT REQUIRED. Ultimate tensile pull out strength 200 lbs on 1/2″ drywall. STRONGEST DRYWALL ANCHOR AVAILABLE (MADE IN USA) 4 Pieces of SNAPTOGLLER TOGGLE BOLTS provided can be used on Gypsum board, Drywall, Tile over drywall, Plasterboard, Composite panels, Cement board, Greenboard, Plaster, Stucco. Easy to use anchors compared to all other anchors available in the market. 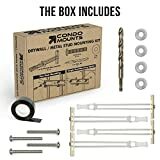 COMPLETE KIT – One 1/2″ hex socket titanium drill bit, 4pcs of ¼ -20 UL Certified hollow wall toggle anchors, 4pcs of ¼-20 x 2” screws, 4pcs of ¼” washer, Electrical tape to mark positions of items you are mounting. Safe multiple trips to the hardware store. This drill bit provided can be used on most drills or driver because it has a hex shank. 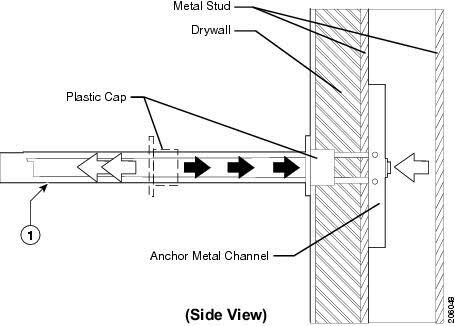 Perfect Screw length of 2″ is provided catering for most wall types. OTHER MOUNTING USE – Mounting of Shelves,Cabinet mounting, Bathroom Accessories, Grab Bar, Vanity, Draperies, Curtain Rods, Blinds and Mirrors on – : Drywall, plaster over lath, gypsum, panels, cement board, MDF. Mounting a TV in condos built after 1980’s are different from mounting TV in a house. Why? Sad but true. The walls are not thick as it used to be. The studs used in construction of internal walls of a condo are 2 by 2 and not 2 by 4s. This is way you will see that a wall dividing rooms in a condo are super thin walls which have a thickness of a total of 3”. The breakdown will be 1/2 drywall on each side and 2 inch stud. So total of 3 inches. Can I mount my TV on a thin condo wall? Firstly we have to understand the three main kind of walls that you will find in a condo. I am referring to walls that have a layer a drywall on it. If they are concrete wall it’s pretty straight forward and you would know this by looking at it. The surface will be grey just like any concrete flooring. a. Most internal are 3 inches with 2 “ metal studs with 1/2 drywall on it. This is the wall type that I am going to help you with and the only TV wall mount that will work with this kind of wall is made by Condomounts. 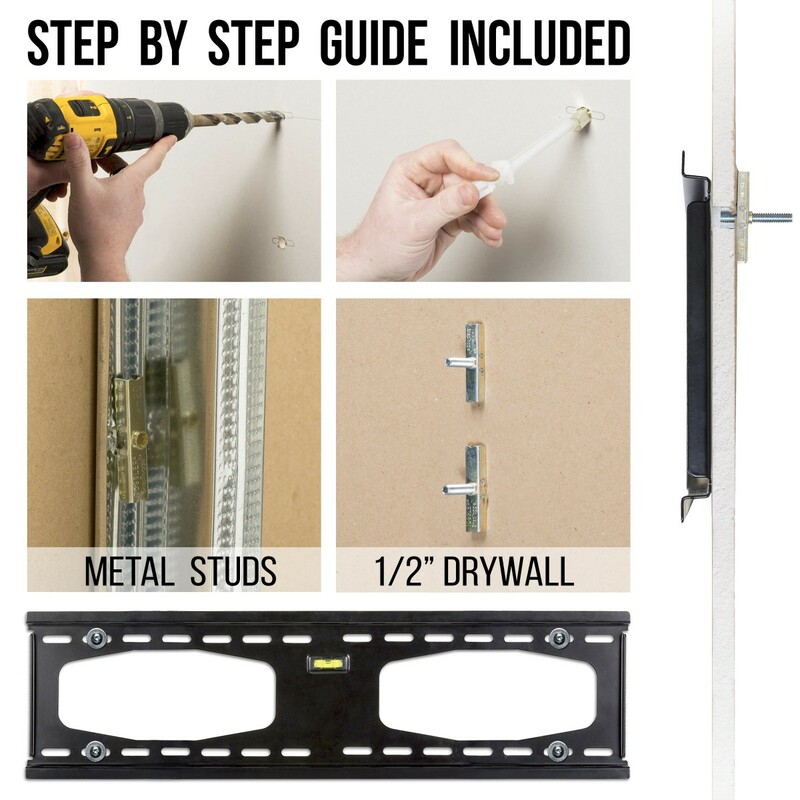 You can either install the TV directly on the drywall or go through the metal studs. 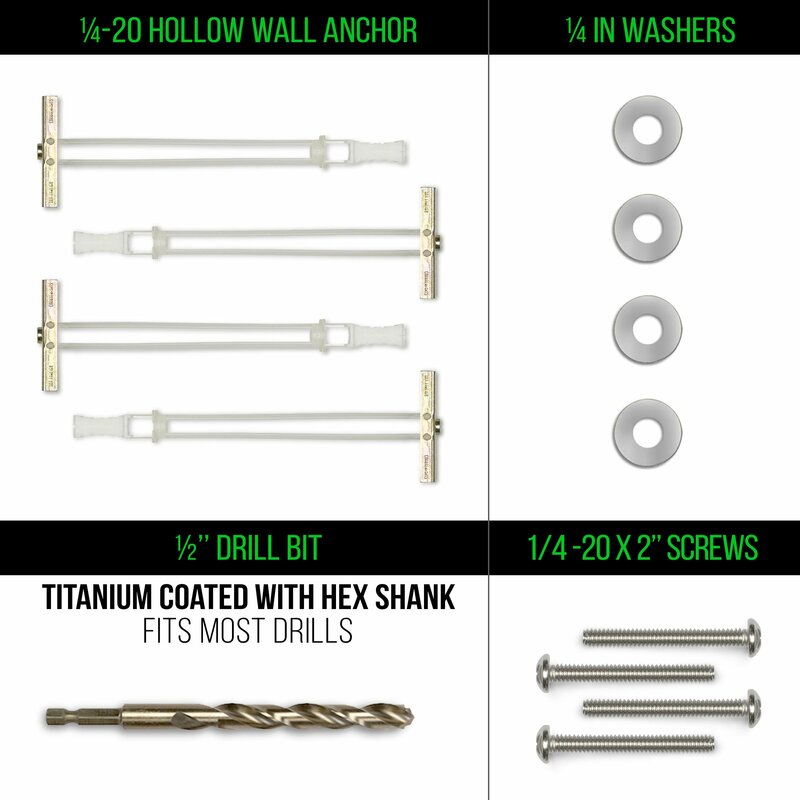 The toggle drywall/platerboard anchors provided in this kit are rated for 200lbs each. You have to use 4 of them to have a secure install. It’s very safe to Mount your tv just on drywall using a fixed tv mount or tilt Tv mount. If you are planning to use a Tv mount with an Arm then you have the go through the metal stud and the same 200lbs anchors can be used but you will need to identify the steel/metal stud and drill through it to insert the anchors. b. Thicker wall which are 10” or more are made of concrete and layered with drywall. These wall can be internal walls or external walls. Internal walls are wall dividing rooms within your unit and external walls are walls you share with your neighbors or outside the house. C. The other type of wall is the double layer drywall. This type of wall is always between your your unit and your neighbors or an outside wall. To mount TV s on this wall you can use the condomount metal stud mounts or steel stud mounting kit bit you might need longer screws.